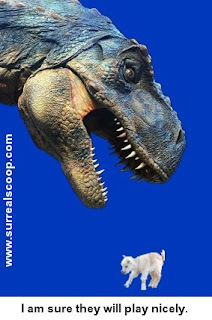 The neighbours of a young goat found eaten to death by a Tyrannosaurus-Rex today blamed the Bedrock Police force for not responding to a complaint that the cave in which the tragedy took place was being used to breed clones of some of the most dangerous predators in Earth's history. Apparently the noise of the beasts' roars were so loud, said another neighbour, that it drowned out the sound of the ritual sacrifices from the cave over the road. Tragedy struck when the parents of young Billy left him in the care of a family member who was also looking after the 7 tonne Tyrannosaur. Police denied that they are responsible for the tragedy but said that they will repeat warnings to the public in case they aren't obvious enough following similar incidents in the town of Bedrock. Despite not acknowledging any blame, Bedrock Police did say they would be lobbying the Home Secretary for greater protection of children with the implementation of a new 'Dangerous Parents Act”.